Some of you may have noticed our site has not been updated for a year now, that because it has been a frenetic twelve months of toil and achievement with little time or reason to augment our tale of exploration. Our home of 41 years in the New Forest which was let unfurnished when we began our voyage in 1999 was in need off radical internal refurbishment. That took six intensive months of effort, replacing all the windows, a kitchen, bathroom, toilet, redecorating eight rooms and by way of a break, recovering two acres of garden. There were two redeeming aspects to this self imposed servitude, an excellent English summer and the introduction to the family seat of our four grandchildren who loved the spacious garden, open forest at the back gate but most of all, an empty ground floor that they could play and rampage through with impunity. Exhausted, we sank back in our aircraft seats in late October for the return flight to Malaysia with yet a further mammoth task ahead of us. In Feb '10 we had been on the way from the Andaman Islands off India, when we experienced a serious engine failure. Around half way out we turned on the engine in the early hours of a Sunday morning (why do traumas at sea always come between midnight and dawn on a Sun morning? ): an alarm sounded around twenty minutes later and after switching off the engine immediately, we discovered all the oil had been transferred from sump to bilge. It turned out that we had a catastrophic leak in an oil cooler that could not be seen, let alone fixed. We sailed around 300nm to the Thai mainland in diminishing winds through the main shipping lane between Singapore and the Red Sea. Hairy !!!!!!!!! With the help of Aussie friends Mike & Rosie on Jemimah we anchored in Patong Bay, Phuket where we managed at great expense to get a replacement fitted. The original part was not available so we had to fit a used unit, compatible only after modifications to the raw water cooling system. A week later we set off for Malaysia only to suffer a failure of the heat exchanger on the first day, so we struggled back to Langkawi with minimal use of the engine. Again we found that a replacement was not available for a Volvo TMD31B that was last built in 1996. We could get an alternative with modification kit at 2,600 GBP. We also had doubts about the longevity of the turbo and exhaust elbow, so it was a no-brainer, new engine! Our Aussie marine engineer predicted that re-engining Amoenitas was a breeze. Firstly because the lifting cockpit sole would make it so easy to pull out the old and lift in the new and also our existing 3.5" ID exhaust system was way above what was required. Only the first statement proved to be accurate. What we had hoped might be a 3-4 week job ended up taking 3.5 months. We eventually launched on Boxing Day (not a problem in a Muslim country), only to discover our sparkling new, grey Yanmar 4JH4 (110HP) did not like the exhaust system from the green, Volvo TMD31B (95HP). No not a question of colour prejudice but exhaust back-pressure. Modern turbo-diesels are about half the weight of their parents but push out a lot more cooling water, steam and exhaust gas. 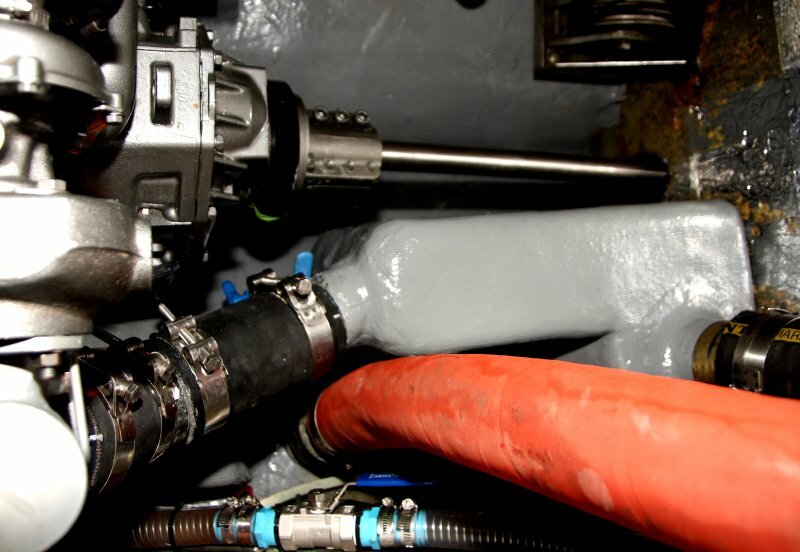 The solution was to simplify the front-end of the exhaust system, fitting a box on the engine room floor for water retention after shut down. Having different input and output pipe diameters plus a very confined available space meant only a bespoke unit would fit in. 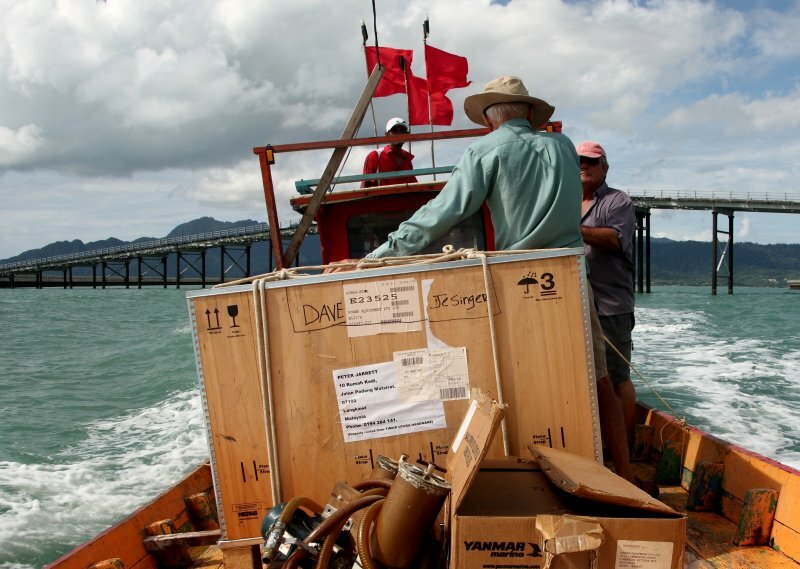 Relying heavily on experience gained building our first boat in the garden back in 1972, we constructed a sturdy fibreglass box using polyester resin which operates at higher temperatures than the more favoured marine epoxy resins. This whole process was taking so much time that our 3 month Malaysian visas were about to expire, so we took off for five nights in Songkhla on Thailand's east coast which was just two ferry, two coach and two taxi rides away from our Rebak island base off Langkawi. Girls on the beach front at Songkhla on Thailand's east coast. This turned out to be a welcome break from boat engines with lots to do and see, coupled with copious lashings of wonderful Thai cuisine. Western visitors are a comparative rarity there, so we were often engaged in conversation and asked to pose with locals for pictures. As you will see, this region of southern Thailand is predominantly Muslim with a separatist movement and periodic violence. 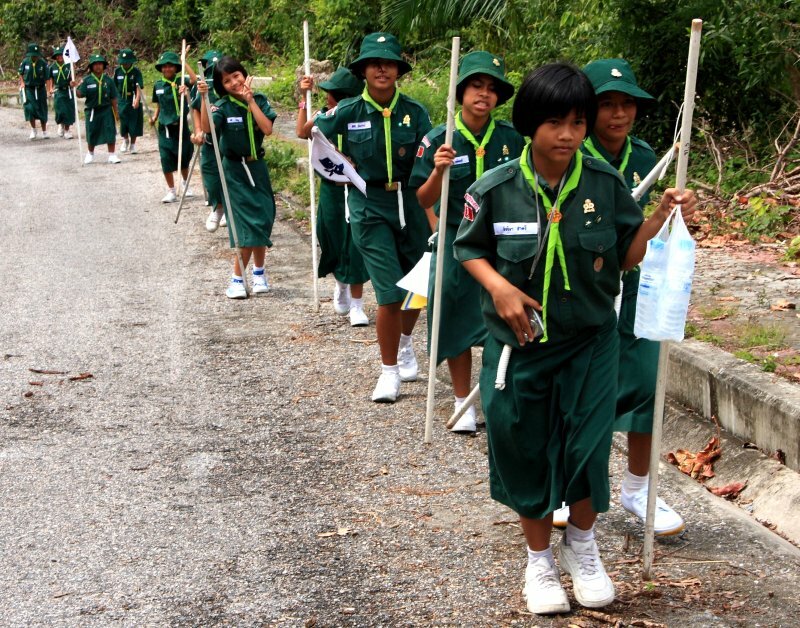 Other things about the place were much more like home, such as this patrol of visiting scouts by the seafront. For balance, a group of guides toiling up a steep road on a hot sticky late morning on their back from a visit to a mountain top Buddhist temple with Royal connections at Tang Kuan just north of Songkhla. All this talk of houses and engines has led us away from our normal theme of passage making under sail which this year, had we not had to replace the motor, was to be a further long leg back across the Indian Ocean, through the Red Sea to the Mediterranean. Thank goodness we weren't able to go! The first problem was an uncharacteristic, violent storm that struck the early fleet off the south of Sri Lanka with reported Force 11 winds and 10m seas. Friend Keith on Baccus, seen with us below last Christmas at Rebak, was overwhelmed and taking on water rapidly was lucky to be hauled off, along with two male crew, just before his Jeaneaux 14.5 sank. We saw the storm clouds on the cable TV weather broadcasts in our apartment in Songkhla and thought of them but never imagined the widespread chaos and damage that would ensue. As if that wasn't enough, the Somali pirate situation has deteriorated rapidly this year. They have invested some of the vast ransom payments in longer range mother ships and better arms and equipment. We had been warned about this through a contact in the OCC (Ocean Cruising Club) who meets representatives of the Coalition Forces with a group of other sailing organisations. Basically, pirates are now roaming as far east as India and south to the Seychelles. and Mauritius. This means that boats heading for both the Red Sea and Cape of Good Hope routes back to Europe are vulnerable. The proof of this came in mid-Feb when the US cruising boat Quest which left from Phuket was taken and all four on board killed during an intervention by US naval forces. Shortly after a Danish boat with a family of five including three children between 12 and 16 plus two crew were kidnapped and taken to the Somali mainland. Needless to say, this has led to serious re-thinking of plans amongst the cruising community, many paying tens of thousands to have their boats shipped onwards. On 5th Feb we began our much delayed cruising season, heading north via the Butang Group and Koh Kraden to Phuket where we chilled out in the company of Alfred & Rosemarie on Ironhorse, long-standing cruising friends we first met in Trinidad ten years ago. We all have a favoured, calm anchorage off a local beach restaurant where the Thai food is good and the beer well cooled. We have been visiting this place for four seasons now so have become one of the family, Dave being greeted affectionately as Papa. Over this short time the character has changed from a quiet place serving mainly cruisers and local ex-pats to a more cosmopolitan cliental of guests, many from Eastern Europe, escaping a couple of large, nearby tourist hotels. We have been used to hiring Pee's, small Suzuki jeep to shop in Phuket, as the place is fairly isolated but that came to an end this year when a Russian guy hired it, only to totally wreck it on an excursion off-road. Alfred and Dave are keen diving partners and the girls love to snorkel so, basic jobs and provisioning done, we set off for the Similan Islands around 65nm NW of Phuket. This is our fourth year here too, three of them intensively diving what is one of the world's best sites with 50m underwater visibility and a vast range of marine life, protected within a National Park. 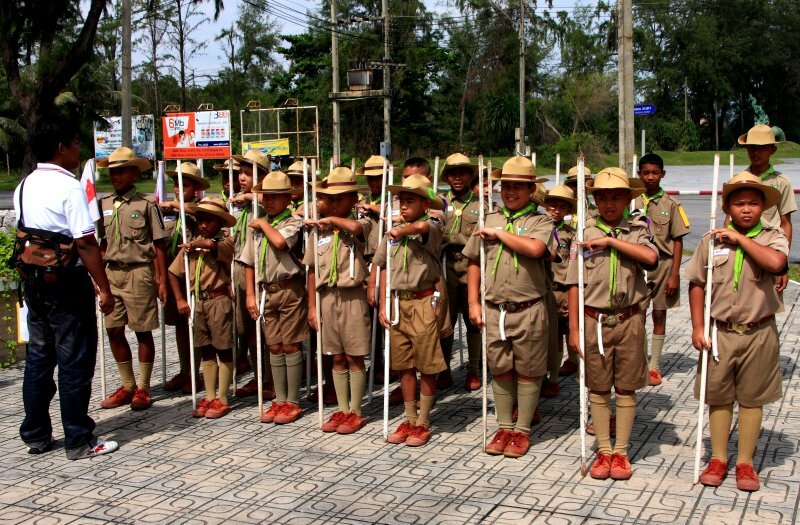 Again we note a big increase in visitors, the tented accommodation at the park HQ becoming a little Russia, whose tourists are now officially Thailand's biggest national group. We also notice a plethora of loud music centres blaring everywhere and that the restaurant has stopped serving alcohol. Fortunately we can at anchor in quiet spots away from the throng and also know the tracks onto the hillsides that few tourists seem interested in. 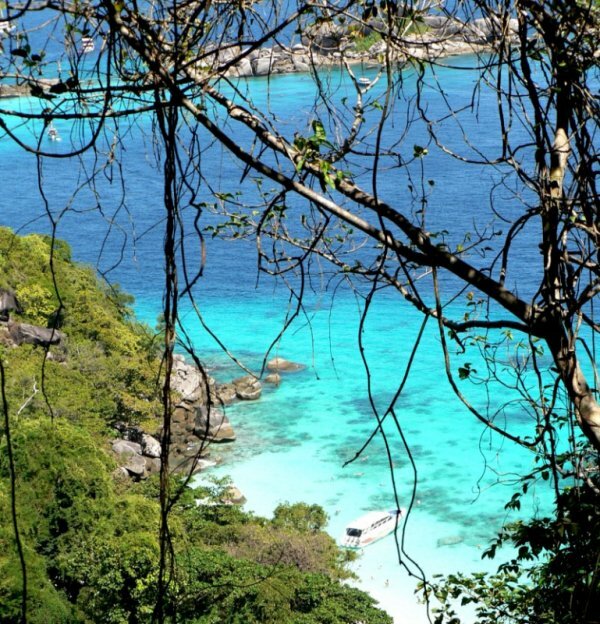 The view below is from atop a huge granite rock set into the native forest on NE side of Koh Miang. We often take a buoy off the rocky island at the top of the picture where there is good diving and snorkeling, especially when you get the timing right, as the currents there can be daunting. 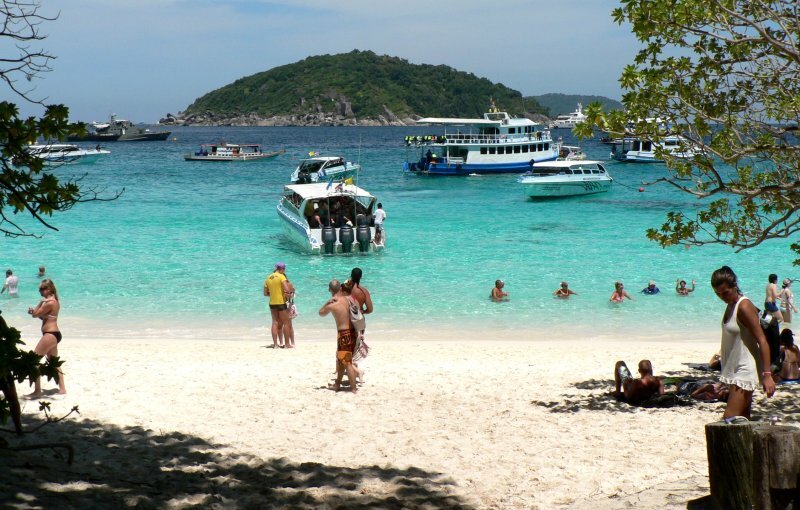 Similan means 'nine' in Malay as there are nine major islands, numbered from south to north. Number one is out of bounds to visitors as it is retained for the personal use of the King. 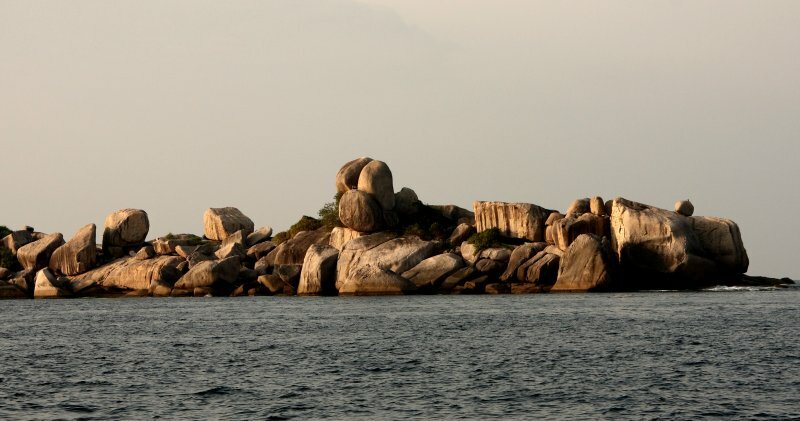 They are all beautiful constructs of large granite rocks formed into amazing evocative shapes fringed by many pure white, sandy beaches. Granite seems to attract the 'Natashas', a breed of young Slavic ladies that love to pose endlessly for pictures taken by friends, or anyone. This a huge contrast with their mother's generation, all too often stranded like huge whales at the water's edge, apparently incapable of movement. Must be careful not to overdo this thread, though it seems common knowledge that Phuket hotels will not accept bookings from certain countries unless occupancy looks like falling well below their target. The Russians seem intent on displacing the Israeli's as the world's most disliked tourists. 'Natashas' love to pose on part submerged granite rocks, or anywhere! We did get in two weeks of intensive diving and snorkeling on five of the islands. Here we are setting out for a 2nm trip to the east side Ko Pa Yu, uninhabited Similan #6. Rosemarie is well protected against the suns rays as she maintains station to guard against us being swept away in what can become strong currents. Having taken so many still images of the marine life of this region, Dave decided to concentrate on video this time, to produce short films of exotic creatures to bore the pants and nappies off the grandchildren (Nemos, snakes, lion fish, moray eels, groupers, colourful angel fish and vast schools of huge parrot fish, to name but a few). 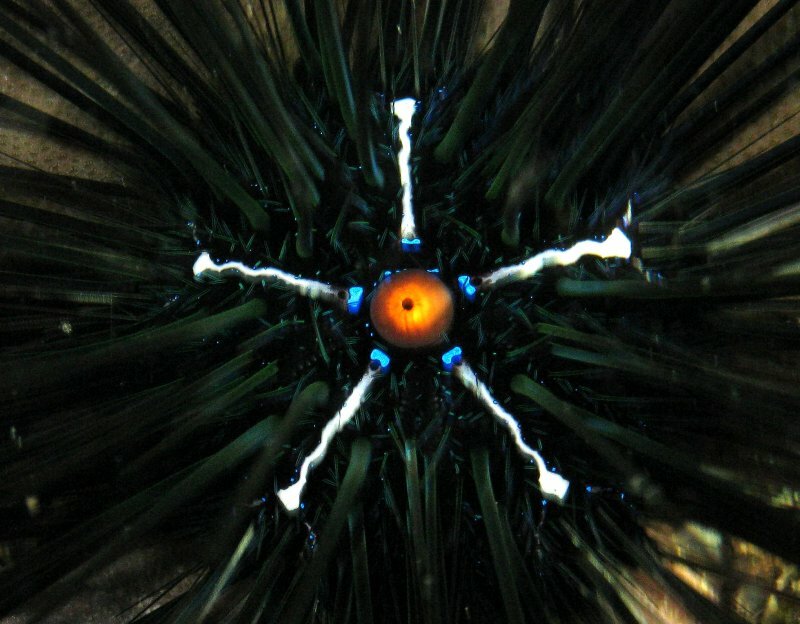 You will not escape however, below being a close up of the heart of a urchin. Getting this picture was not as easy as it might seem as the creature has sharp, poisoned spines 20cm (8") long which if they get into you , break off to leave you in considerable pain for more than a week. We are unsure of the role of these markings. Not all specimens within a group have them, some have just the five white spots, some no spots at all. Not all have the central eye-like structure. The mouth and outlet are on the underside along with crude legs and modified spines to move around with. The body cavity is largely empty, being used to store large quantities of eggs or sperm during the mating season. One thing that was very obvious below was the enormous bleaching damage to the reefs which occurred last year when the cooling Monsoonal clouds did not appear from April through to June. Comparing photographs taken over the years, the level of devastation was clear for us to see, almost total annihilation over an extremely wide area. We had heard warnings from marine scientists of the climate change dangers to tropical reefs but had never expected to see such sudden and dramatic changes. Now at last, we get to the intended subject of this update, life aboard. When we were back in the UK last year a number of observers of our site said they enjoyed the images of far away places but were curious as to what our life aboard Amoenitas was like. Hopefully, we can answer some of those questions with the next few images. Firstly, the crew taking time to pose on the foredeck whilst under full sail heading south from Thailand to Malaysia. 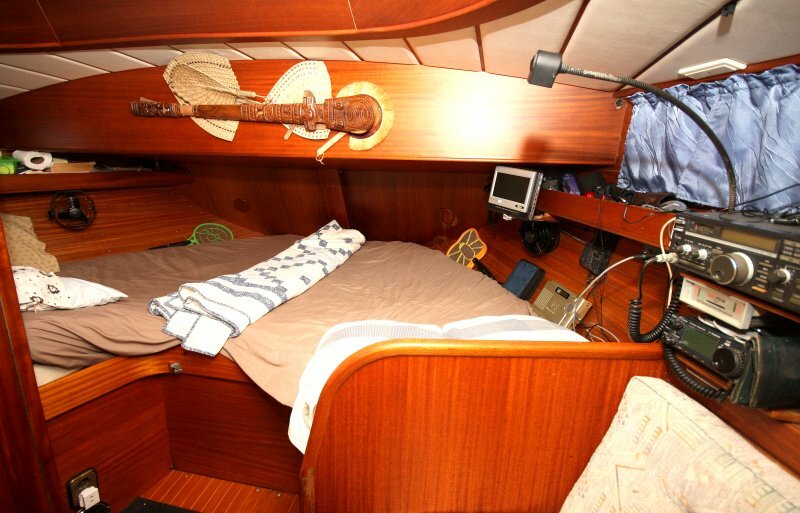 We'll start the tour below with the aft cabin where skipper and mate sleep. Above the bed is an intricately carved, ceremonial casse tete (literally, breakhead) which we acquired from a carver named Tui on Haka Hau in the Marquesas (French Polynesia) in May 2002. Thankfully it never gets used so Di has her 'fan club' tucked in behind it. No, we don't play tennis in bed, those are electrified mosquito zappers which are rarely needed. Not like the personal fans which are pretty essential in the tropics if there is no breeze. Inevitably, Dave's side is readily identified by the video player and no less than four radios (small Sony multi-band attached to the hull, WorldSpace satellite receiver just below it and two HF transceivers (Icom-725, Icom-706MkIIG) with a Pactor modem for e-mail on the RHS). The aft en-suite with shower, toilet and washbasin is on the left, behind Di's bunk so not far to go in the night. Next stop on the way forward is the currently much featured shrine, or engine compartment which Dave feels he's spent so much time in during the past few months, he is considering erecting a hammock and moving in. As you will have noticed it is a tad 'busy'. 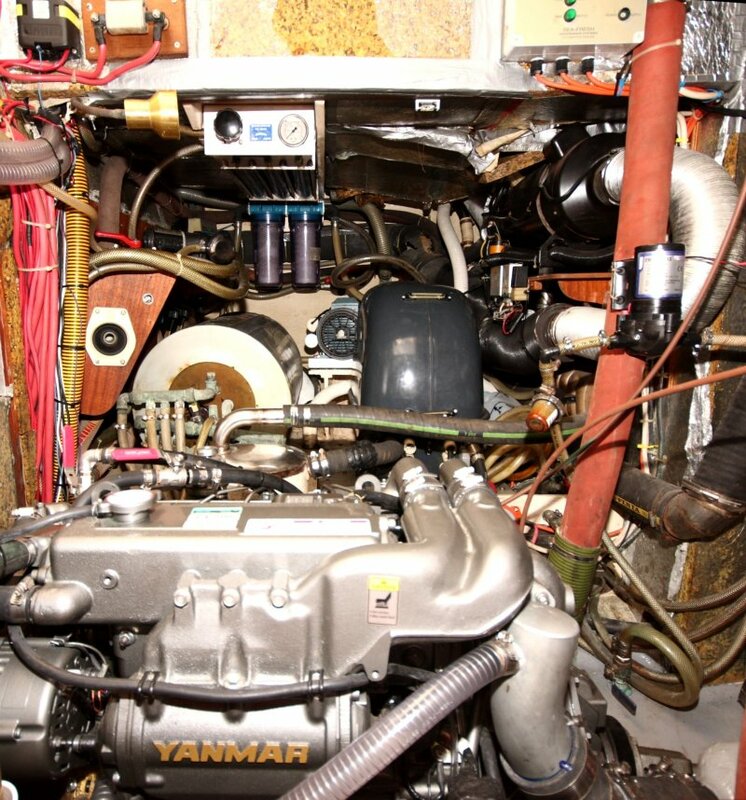 On a shelf behind our shiny, new Yanmar 4JH4 (110HP) engine is the cylindrical calorifier hot water tank that is heated by the engine and a 240v immersion heater and to it's right is the 4.5 KVA diesel generator set. The black cylindrical object on the RHS, linked into large diameter piping is the Eberspacher space heating unit, not a lot of use in the tropics, in fact never used since leaving European shores. In the background you may make out the components of the watermaking system, high pressure pump below, dual input filters in the centre and three 1m long semi-permeable membranes with pressure meter and control knob above. Off picture on the LHS is a mass of heavy 12v and 24v wiring and on the RHS the fridge and freezer refrigeration units. One of the constant and consuming concerns when cruising is the supply of water. In most places we visit marinas are rare or non-existent and local supplies questionable. In Thailand for example, there is no widely available, high quality piped supply. Most people rely on their own or a shared local bore hole with drinking water brought in in large white, plastic bottles or processed by expensive, home, reverse osmosis systems. Fortunately, Amoenitas has such a system driven by a 1 HP electric motor powered from our 240v, 4.5 KVA diesel generator set. This drives a pump which pressurises the seawater to around 850 psi for injection into the three, metre long semi-permeable membranes. In tropical seas at temperatures of 30+°C it will produce around 135 lts/hr of very pure water which is so devoid of all trace elements even, we need to take some supplements. Typically, we only run it every 3-5 days, even when showering extensively. It has to be used at least every seven days to avoid growth within the membranes and if it is not to be used, must be de-commissioned by 'pickling' with a solution of sodium metabisulphite. So, it requires careful management but transforms cruising life beyond belief. 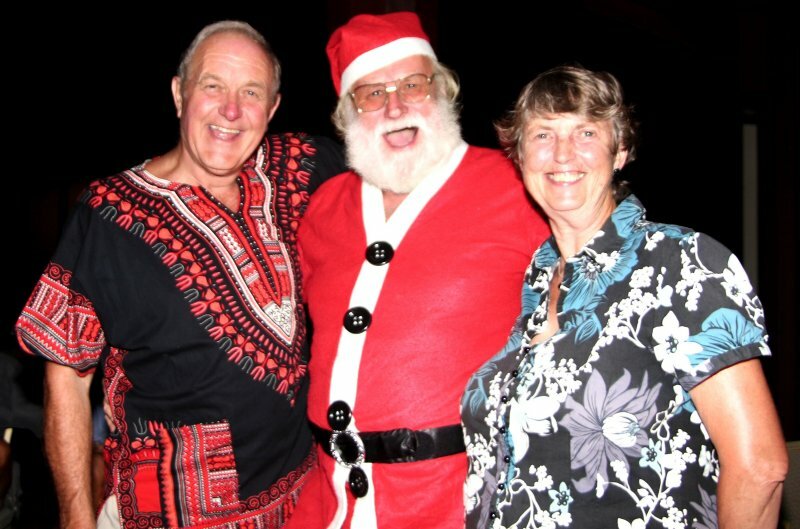 We often keep friends without watermakers going in remote places and in the Lau Group of eastern Fiji in 2003, we kept a whole village in drinking water during a prolonged dry spell. Below, Dave can be seen filling water bottles from the diverted supply which normally feeds the 1100 ltr water tank housed in the keel. The large bottles are for the kettle and cooking, whilst the small ones go into the fridge for drinking. In case you are wondering what the bright blue object strapped to the rear wall of the engine compartment is, that's the cushion covered in toweling that Dave produced to put on top of the engine when he has to lean on it or sit on it to get at other gear. The galley is based on a long 'L-shape' surface with fridge door just behind Di, deep freeze in the hidden corner to the right and two bowl sink unit around the corner. The cooker is a stainless steel, two burner Broadwater unit with grill and oven that we installed in Australia. 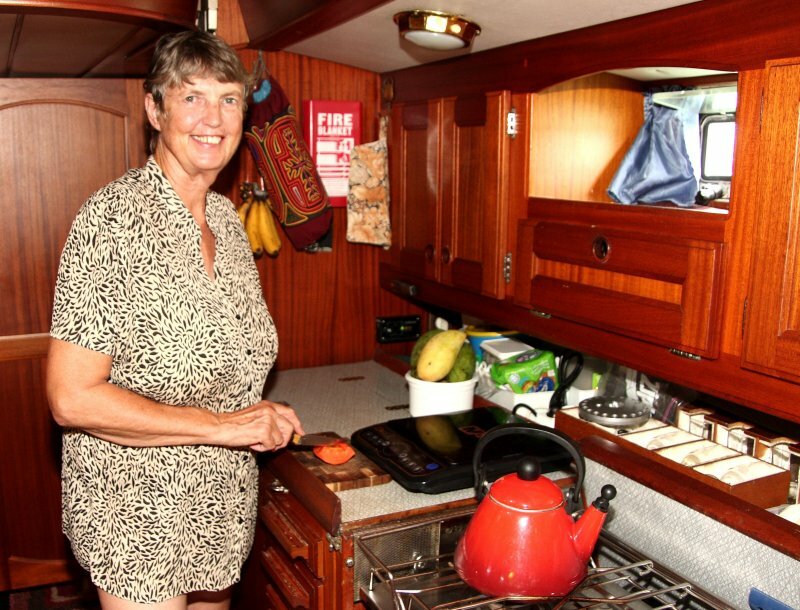 Now we spend more time in marinas where the last thing you need to dilute the effectiveness of the air-conditioner is a gas flame, she uses an electric powered wok and a tidy induction hotplate. The latter is a temperature controlled, 1.9Kw device that heats only the pan and contents, ideal for tropical climate cuisine. Next stop on the port side after the galley is the nav area with large chart table and drawer, still used for their original purpose but now more frequently than not replaced by electronic, computer based navigation. On the LHS is the board with 28 switches that control lighting and other circuits. To the RHS of that is a messy board that has two car radios (one tape, one CD) along with controllers for septic tank discharge, boat heating, hi-fi, fan, chargers, etc, etc. You may just notice the MP3 player plugged into the hi-fi amplifier panel which provides high quality reproduction of music, voice and podcasts to speaker systems in the cabin and cockpit. The square grey instrument relays sailing conditions such as wind, boat speed, water depth, and temperature, etc for monitoring below. 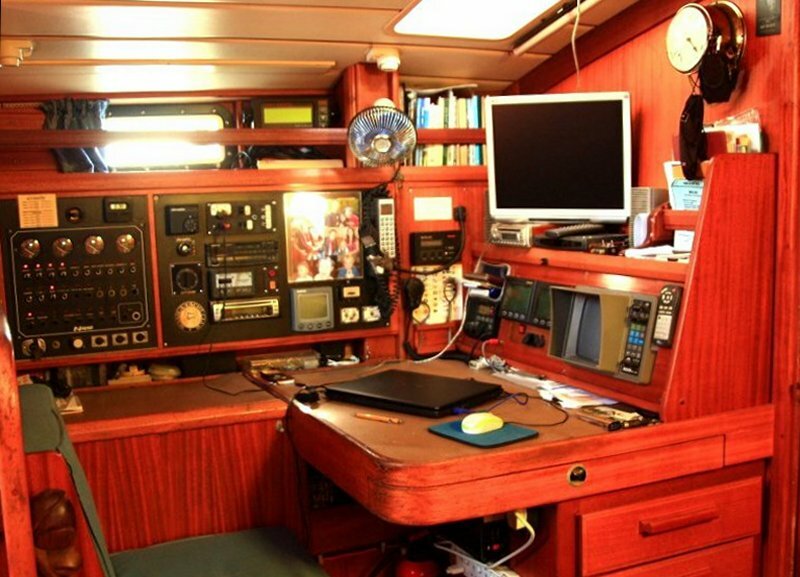 Last on the hull side is an electronic barometer and the secondary marine VHF transceiver. Facing forward you can see the primary VHF, graphical barometer, AIS display (Automatic Identification System which on the basis of transmitted GPS positions from other vessels, enables a radar like plot of other traffic in the area). Next to that is our conventional radar display. Behind is a flat screen based entertainment system for CD/DVD/MP3 and computer screen relay. Hanging from the clock are a mobile phone and sun glasses. 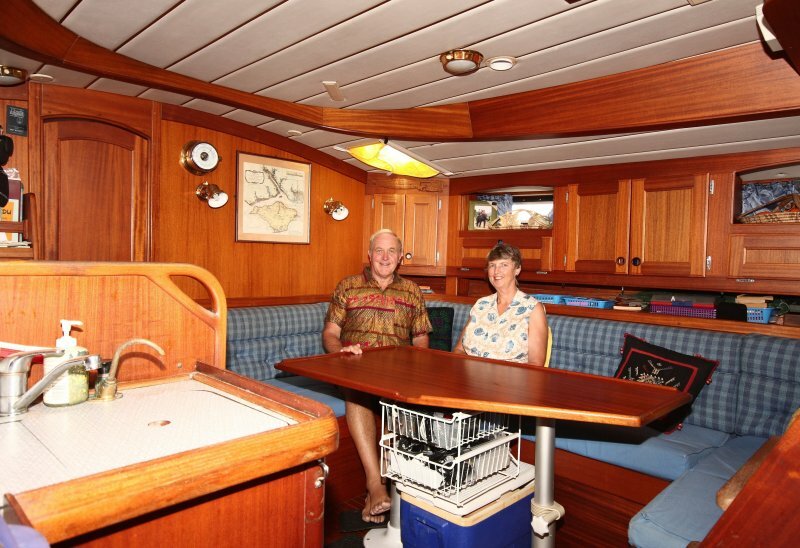 Now we've reached the centre of the boat and the main saloon where we eat, entertain and more usually, clutter with the everyday items cruisers are prone to cast casually aside. Note, that in true cruiser style, no space is left unused, including any spare under the table. On the bulkhead is a historical survey of our home waters, the Solent and Isle of Wight, last revised in 1794, so not now suitable for navigation. It replaces the previous owner's picture of the original Amoenitas which was built by the Sietas ship yard in 1838, the last sailing ship in the fleet of his family's Hamburg company. 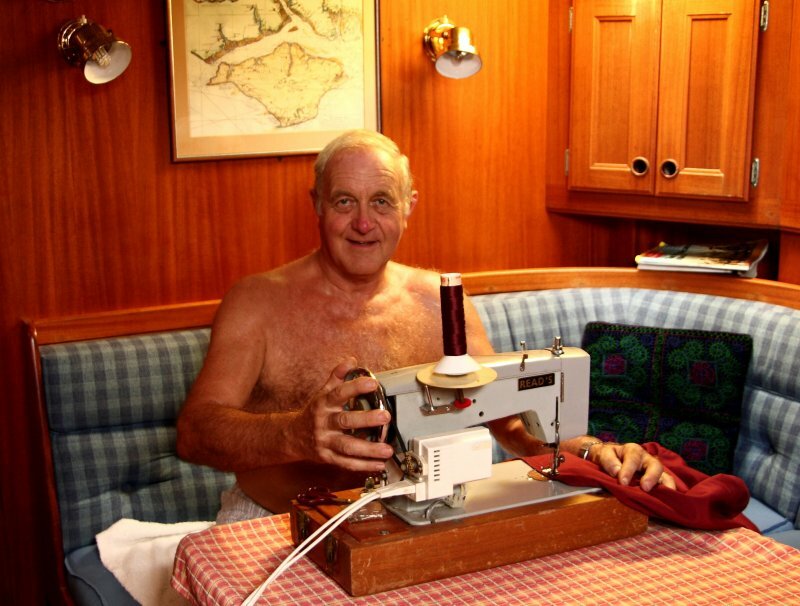 One essential item of cruising kit is a sewing machine capable of repairing sails as well as stitching up to six layers of canvas. Ours is a Reed's Sailmaker which originally came from a local shop in Shirley high street in Southampton. There is a saying on Amoenitas to the effect, don't stand still for for too long or you are in danger of being clad in Burgundy Sunbrella canvas. Dave is the chief machinist, the result of many hours turning the handle of his mother's Jones machine in his youth. Toshiba Tecra A3/S2 (XP) centre rear - Grandfather of the clan, bought in Sydney, Australia in 2005. It is the only machine which recognises our iPad (shame Apple) and supports our main navigation software without introducing too many Com Port issues. Acer Aspire 2920 (XP) rear RHS - Bought here in Langkawi in 2007 and the workhorse machine ever since. The only other machine which loads Apple iTunes but sadly it will not regognise our iPad. Acer Aspire One (Linux) centre - This is our miniature travel machine with flash rather than hard-drive memory which is used for communication and image downloading whilst touring on land. It does this superbly and being Linux is extremely secure and free from contamination in dodgy places (Apple does not offer a Linux version of iTunes). Acer Aspire 4738G (Windows 7) LHS - Our latest laptop which is growing on Dave with every time he uses it. He was a virolent critic of Microsoft in the Vista era but has to admit that the Windows 7 MMI is a significant improvement. The only annoying shortfall is in the incompatibility of much of the legacy software (even such basics as printer drivers!). To overcome this we have segmented the hard drive, installing a virtual machine in the partition which runs XP professional, the best of both worlds. Apple iPad Tablet (60Gb 3G), front - This is a tantilising piece of hardware giving access to a whole new world of computing experience. For us a major feature is the built-in GPS which makes travel by land and sea so much more interesting. 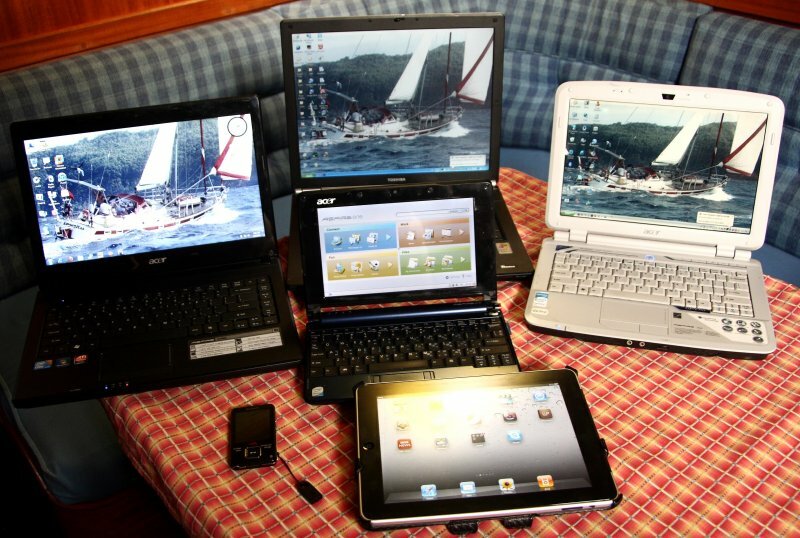 A downside in our cruising life-style is its dependence on a good WiFi connection. The 3G we have found to be pretty ineffectual but maybe this is a SE Asia problem. As with all Apple products, the serious downside is the company's control over your hardware and it's propensity to attach a large capacity conduit to your bank account. This and the lamentable iTunes software has induced us into the 'Jailbreaking' community and it really is great to be free! Dave is amazed that iPod & iPad devices, sold in their millions are dependent on such crap software. Entertainment is a major role for this device, we have a large library of movies in MP4 format. Sony Walkman MP3 player (8Gb), bottom LHS - Though the smallest, item on display, this is our most used and dearest shipmate. In addition to music, it gives us access to many hundreds of hours of Podcasts from the BBC and ABC which we download copiously when a good WiFi link is available. We have around 49Gb of MP3 music to choose from, about 2,300 hrs of everything from classics though popular, country and jazz to radio programmes like Goon Shows, Hancock, Yes Minister, I'm Sorry I Haven't a Clue, Beyond our Ken and Navy Lark. Forget over rated iPods, pure MP3 is the most cost effective and convenient way to go! You'll have realised by now that, from the first moment we escaped the cold, murky waters of the English Channel, exploring what's under the water has been one of our major preoccupations. As our voyage progressed we became increasingly involved in identifying and photographing all things marine. Di has had problems clearing her ears so has not dived but Dave has taken every opportunity on offer from the Caribbean to Easter Island and every suitable site we've visited in the South Pacific, South China Sea and Indian Ocean. More usually, we would go off in our inflatable, two person canoe for three or four hours exploration on remote reefs. 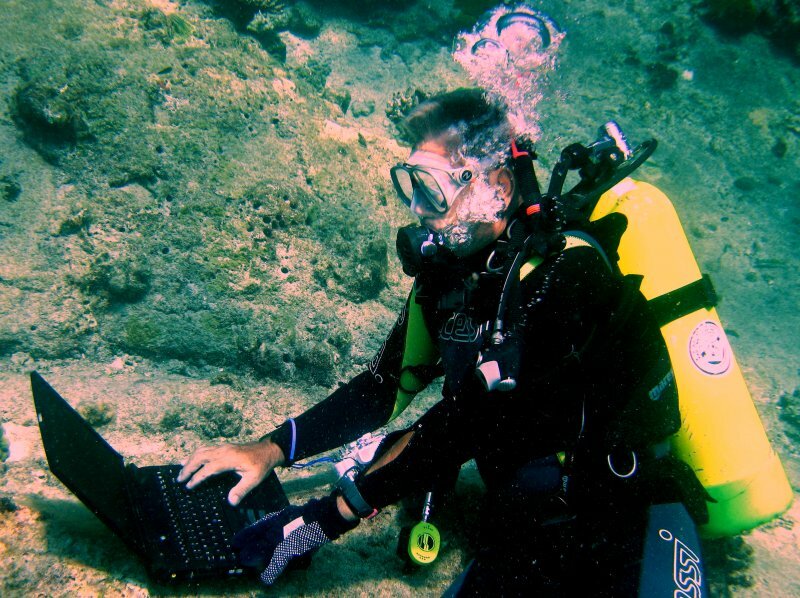 The secret of diving remote places is to have an independent source of compressed air. We set out with a Bauer Junior compressor powered by a 5HP Honda four-stroke engine which charges normal sized tanks from empty in around 20 minutes. This is too bulky and heavy to manoeuvre aboard in one piece so for storage we separate the engine from the compressor with a set-up or tear-down time of around 25 minutes. However, it does store conveniently in a single, under-bunk locker with the engine housed in large plastic storage box. 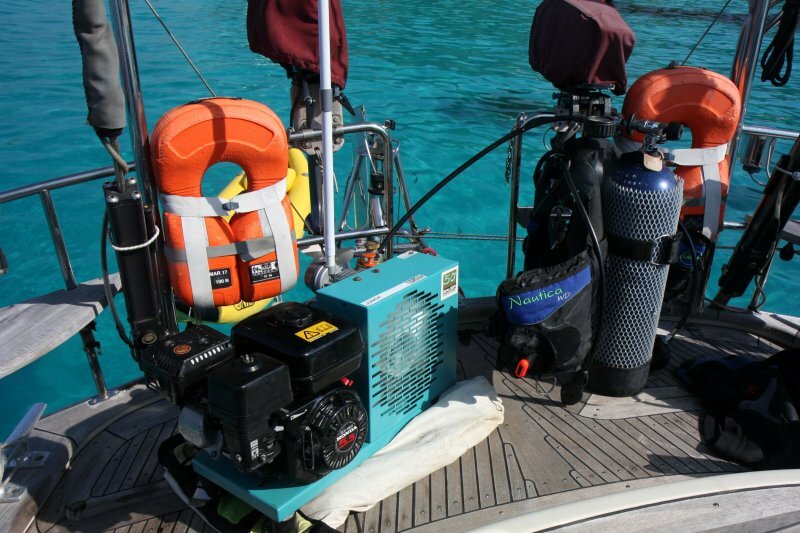 Noise is a definite problem with compressors, requiring ear defenders for all aboard whilst at the same time attracting other divers in the anchorage with bottles to be filled. Obliging them leads to even longer periods of deafening noise but can sometimes help find a dive partner or advice on good sites. 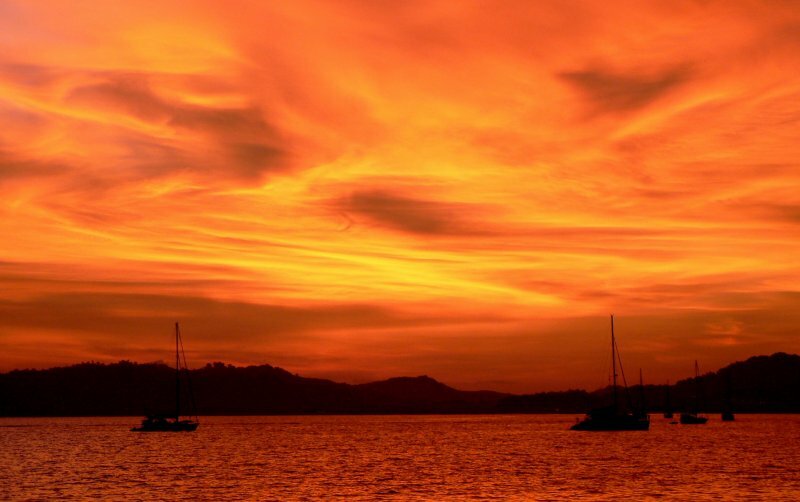 We cannot leave the subject of our cruising life without mentioning our Malaysian marina base where we are just beginning our fourth year of occupancy. Rebak is a small island (1 x 1.5Km) around 2Km off the tourist island of Langkawi in the NW of the country, only 20Km from the border with Thailand. 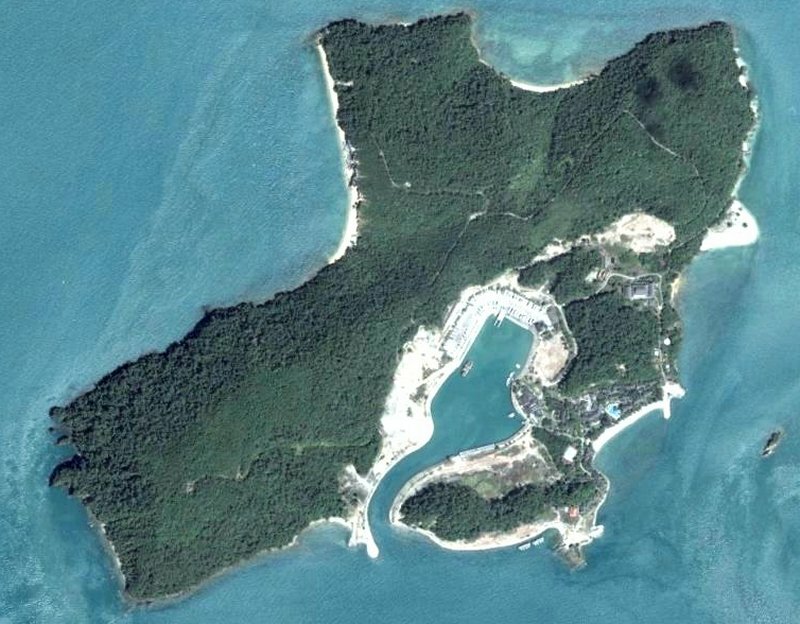 The satellite image below was taken around 2005 after the previous year's Tsunami which devastated the marina when the surge of water lifted the pontoons off their piles. The island is home to just a beautifully sheltered marina and a 4 Star hotel, a great place to leave a boat securely or hang out, provided you are not troubled by a total lack of retail outlets. 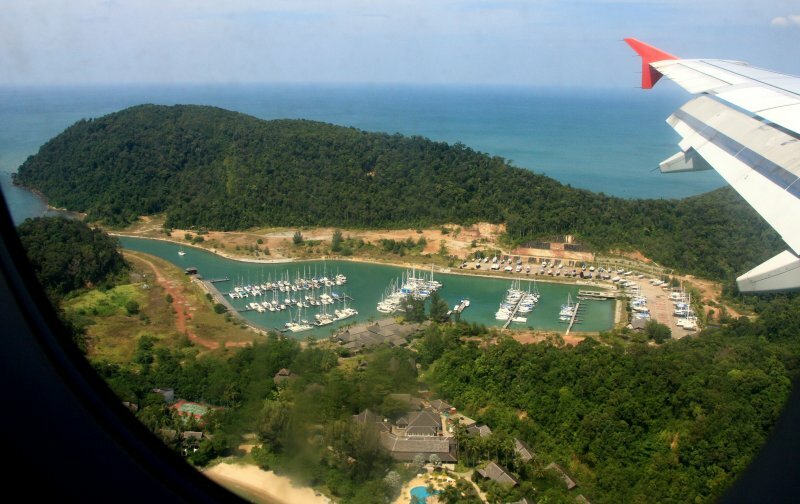 Below is a view of the marina as you fly close by on the final approach to Langkawi airport. Beyond the marina on the RHS is an extensive hard stand where one can be hauled to antifoul, refit and of course replace engines. The main hotel complex with superb swimming pool can be seen at the bottom of the image. Life in the marina and more particularly 'on the hard' tends to be hot and sticky. Daytime temperatures are in the low 30's C with little respite at night, coupled with humidities often around the 80-90% mark. Not unnaturally around 4-5pm we head to the pool to reduce body core temperatures ahead of the pleasant evenings that begin around 6pm. This is probably the most magnificent pool we have ever had the pleasure of basking in. It is surrounded by many species of splendid palms and just beyond is a beach with a superb view over toward the bigger island. We often seek to bid you farewell with a suitable sunset and this year there have been a surfeit of them. Anchored off Kuah, Langkawi's major town, earlier in April we had them night after night. This one from 4th April was blessed with a complex pattern of cloud activity. As you have probably gathered, circmnavigatigators headed for the Red Sea route to the Med or even the route to the Atlantic via the Cape of Good Hope have some rethinking to do. We are not too worried about this as we are in good health and still relishing cruising these waters studded with beautiful islands fringed with white sandy beaches and clear turquoise waters. So, for the time being, Amoenitas has become our floating winter cottage. It would seem that the Somali pirate threat is here for some time so we will have to review the situation annually with the option of eventually selling Amoenitas locally or more likely, having her shipped back to the Med.